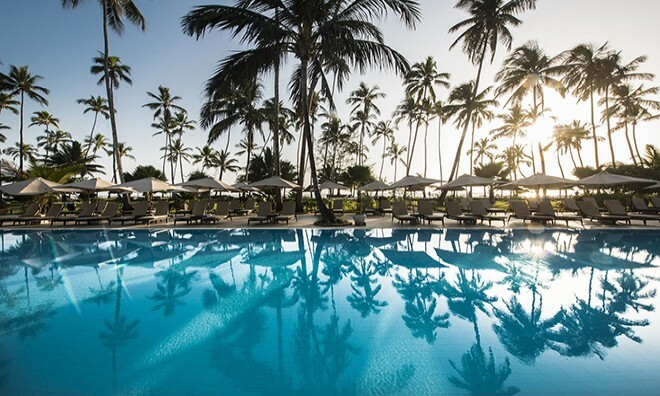 This resort in Zanzibar is nestled on the north east coast. 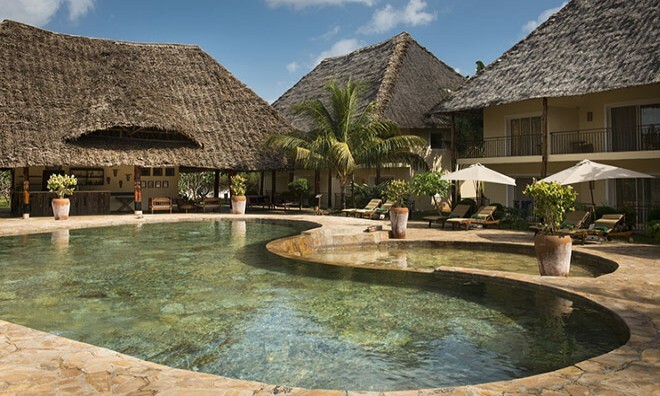 This luxurious and exclusive 5 star all inclusive Zanzibar resort is set on the beach of Kiwengwa and is about 45 km from Stone Town and Zanzibar International Airport. 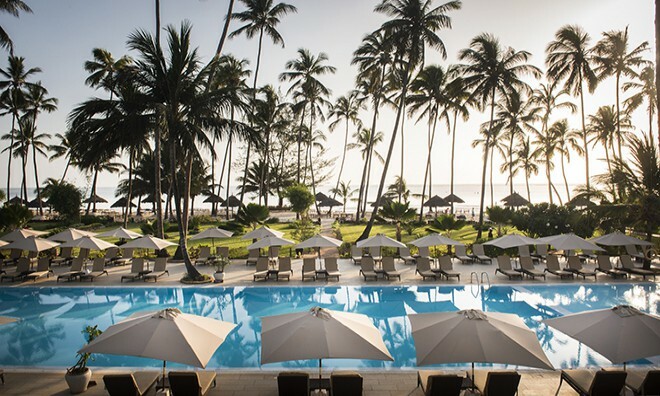 Dream of Zanzibar is an exquisite and modern resort in East Africa with a stunning blend of local Afro-Arabic design of solid woods and luxurious materials. 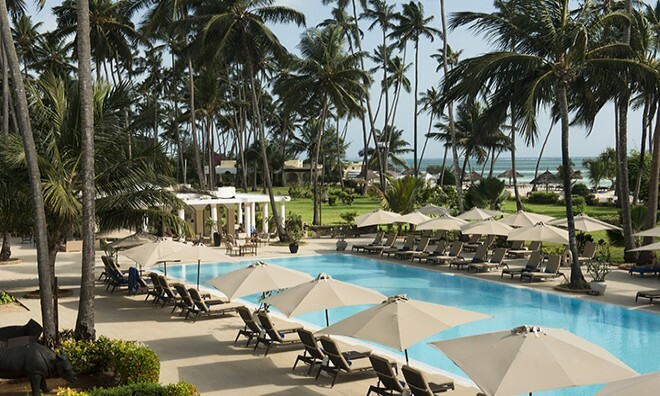 This Zanzibar hotel provides accommodation of the highest standards and top modern comforts. The 157 rooms have large en suite bathrooms with walk-in showers and double basins. All rooms have a spacious private terrace with table and chairs. Room categories include 104 deluxe garden rooms with communal swimming pool, children area and bar, 40 junior suites ocean view, 10 junior suites ocean view with Jacuzzi and 3 Beach Villas with Jacuzzi and private pool. King size or European twin bed with mosquito net, Individual climate control and ceiling fan, IDD telephone and digital in room personal safe, Internet access (with cable), TV with satellite channels with DVD and CD player, Stocked Mini bar with Coffee and tea making facilities. Welcome cocktail, Breakfast, lunch and dinner served at the main restaurant, Lunch buffet served on the beach at The Taj Mahal, Sushi Bar, Zanzi-Bar Grill outlets -Weather depending, Soft drinks, fruit juices, beer, house wine, tea and coffee and selected spirits served at the restaurants and bars as per schedule, Dinner served at The Chop Stick, at The Boma Restaurant and at The Andiamo Pizzeria Restaurants, Snacks offered at the Pool bar throughout the day, Water gym, canoe, beach volley, football, table tennis, billiards and darts, Beach towels, sun beds and beach umbrellas. 24 hours reception with concierge and luggage store room, Business Center and wireless internet connection (at charge), Laundry and valet service (at charge), First aid in house clinic and doctor on call (at charge), 2 Swimming pools, 1 with children area, MVUA African Rain Spa with indoor gym, Baby sitting service, Boutique, Conference Centre, Animation team with daily entertainment, Water sports centre. Credit cards accepted: Visa and Mastercard. 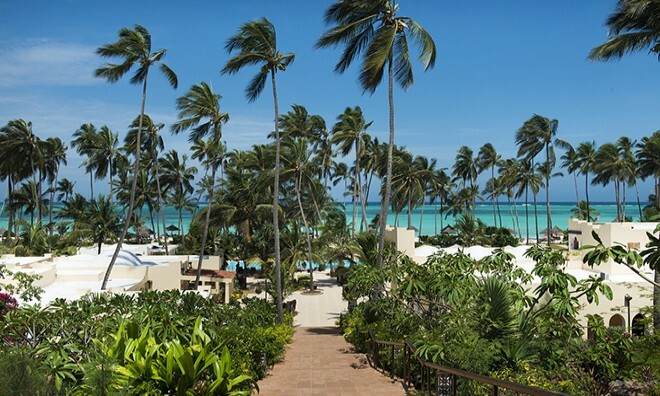 Enjoy a holiday in Zanzibar at this resort to indulge in a lavish buffet for breakfast, lunch and dinner. Special theme nights are organized on a weekly basis with menu featuring light and delicious international cuisine. 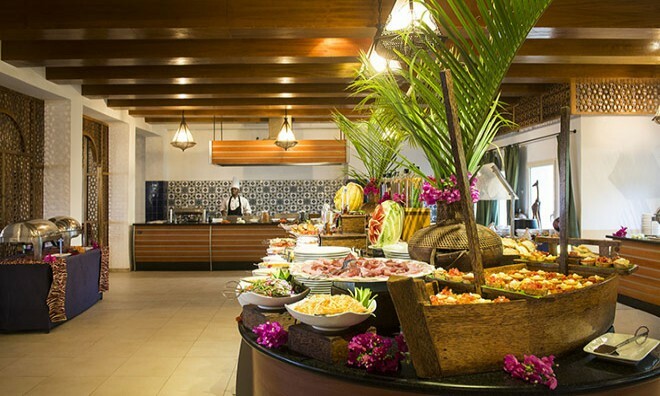 Located directly on the beach, they serve an all inclusive buffet lunch depending on weather conditions and with limited seating capacity. Open for dinner, serves fresh pizza, salads and healthy food. A' la carte menu. Open for dinner serves regional and local African dishes buffet style. Open for dinner serves Asian specialties. The finest luxury a ' la Carte restaurant offers seafood and fusion cuisine, open for dinner only. The Kokosnuss Bar, The Mama Paw Garden Pool Bar and Le Souk Bar. This hotel in Zanzibar has a Spa that provides hydro therapy, indigenous treatments, Jacuzzis', relaxation lounge, steam rooms, private showers and a beauty salon. Full range of cardio conditioning weights, treadmills, lifecycles and step machines are available at the indoor gym. Shuttle service to and from Stone Town, Sightseeing and land excursions, Safaris to Tanzania, Diving snorkeling and deep sea fishing. With transfer to the west coast. 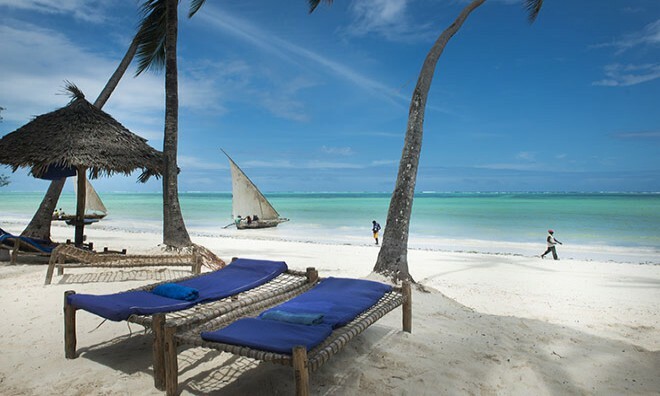 This Zanzibar beach resort has everything one would need from a luxurious accommodation, offering a tranquil getaway for the weary traveller. Why not share your experiences and reviews with the community and write a review for Dream of Zanzibar.